Is it possible to Install Apps directly in External storage without consuming any space of Phone's Internal Memory? I don't want to waste the space of phone's memory.In other word , I want to install apps to my SD card.However it looks impossible as there is no such option in my phone.I tried "Apps to SD" application which says that it transfers Apps to SD card but when I tried it, i found that the application was still capturing some space on Phone's internal memory.So I want to know whether there is any method to Install an apps directly to SD card so that it doesn't consumes any space of phone's internal memory. How to free the internal storage space on Motorola RAZR XT910? What is the Procedure to Increase the Internal Phone Memory of Android Mobiles? I have 32 GB external Memory card but my mobile still shows "Memory out of Space"? How to determine the space left on Google Android device? Re: Is it possible to Install Apps directly in External storage without consuming any space of Phone's Internal Memory? There are many apps in android market for down load apps in SD card. But some apps are given as factory given apps in your phone and these are not removable or transfer from your phone memory to your sd card slot. seconly if your sd card has low memory then apps are not transfer to your sd card. There are apps which will install in SD card & in phone memory.But even those apps which you install in SD card will provide little bit effect on phone memory also. But not that much just 1 kb or 3 kb.but those apps which are already in phone memory can not be deleted.Those apps upgrade by itself.& consume space. There is no possible way to stop apps to consume your phone memory.You can transfer the apps.You will find in Manage application.Click on app which you want to move.A new page will open in that you will get option to transfer the apps. 1. DOWNLOAD JDK AND SOFTWARE DEVELOPMENT KIT (SDK) ALONG WITH PC SUIT IN YOUR COMPUTER. 2. NOW ENABLE THE USB DEBUGGING MODE FROM THE PATH "setting>application>development>usb debugging". 4. After installing sdk, install sdk , install android sdk in your computer. 5. Now, you will have to head to the toolkit which contains the Android Debug Bridge. 6. After this, you need to connect the Android phone to the computer using the USB Cable. It is not possible to make SD Card as a default memory storage in Android devices.But there are Apps available to transfer "Installed Apps" from Internal memory to SD card Memory. I have tried different such apps and the best one is "Gemini App Manager". The app is excellent in shifting the installed apps to SD CARD Memory. More important is that it will not occupy any storage space in Internal Memory. How to Get rid off this Prob? Pre installed Google Apps occupy Huge internal Memory, So i advise not to update the pre installed Google apps frequently(Maps,Navigation,Earth etc..). Thats the major reason for losing huge internal memory. 2. From your Android Phone Go to Settings > Applications > Development > Make sure USB Debugging mode is enabled. 3. Connect your Android phone via USB cable to the PC. 4. Run the unzipped program. 5. Click the Root button and wait for it to finish. 6. Now your phone is rooted and can enjoy superuser's privilage on your Android. Hi Friend,There are many apps in android market for down load apps in SD card. But some apps are given as factory given apps in your phone and these are not removable or transfer from your phone memory to your sd card slot. seconly if your sd card has low memory then apps are not transfer to your sd card. I hope it helps you. Sorry dear, you cannot install Apps directly in External storage without consuming any space of Phone's Internal Memory. But you can tranfer the installed app to the External storage,you have to install an app name " Gemini App Manager"
In some phones, all the apps get installed into the PHONE MEMORY directly. It is by default in those phones which cannot be manipulated . But a solution of such issue is possible. You can download an app called APP TO SD from the PLAY STORE and it will transfer all possible apps present in the internal memory of the device to SD CARD. This app is available in PLAY STORE for free. Some apps of Android market gives you the facility to nlinstall directly on your SD card. All you need to do is just tap on Modify storage but not for all apps. You can moves your apps by using App2sd, you have already mentioned. Though you have moved your app to sd ,it will occupy some space on phone memory, some system files. It wont occupy much space.You have bear it.No need to worry dear. No thats not available for each and every app.So you cant directly install application in SDcard. But there is another alternative for you .There is an apllication known as App2SDcard. The files which are installed in your memory card are the main files but those files which are consuming space in your mobile phone memory are not big in size. They consume space only in kbs which are the cache files and third party installation data. You can change its location. They has to be installed in phone memory but those apps which you delete from your memory card after installation you can delete their cache and temp file from the phone memory which creates lots of free space in their. There is no problem to delete those files. Actually, every app takes some space but a few will not because of its type. The space will be taken less as it will stored in External storage. If you have apps in Internal storage then it will take huge space in respect on internal memory. 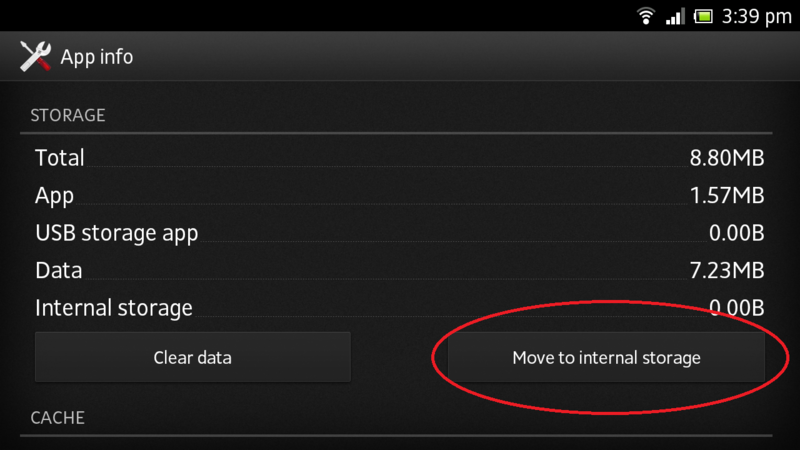 In Jelly Bean you can go to the settings>> Storage setting>> Default Storage>> Set to SD Card. How to Install Apps in SD card to Prevent the Excess use of Phone Memory? How much Internal Phone Memory an Android set Has? How much Expandable they are? Unable to find what is causing Low Space problem as I have used the least space of my Phone's memory? All times are GMT +5.5. The time now is 03:34 PM.